While this web site will help you to get to know Horace Mann School, nothing compares to a visit to our campus. Taking a tour, talking with students and faculty members, seeing classes and activities in action will all give you a sense of the excitement and energy that fills the school. 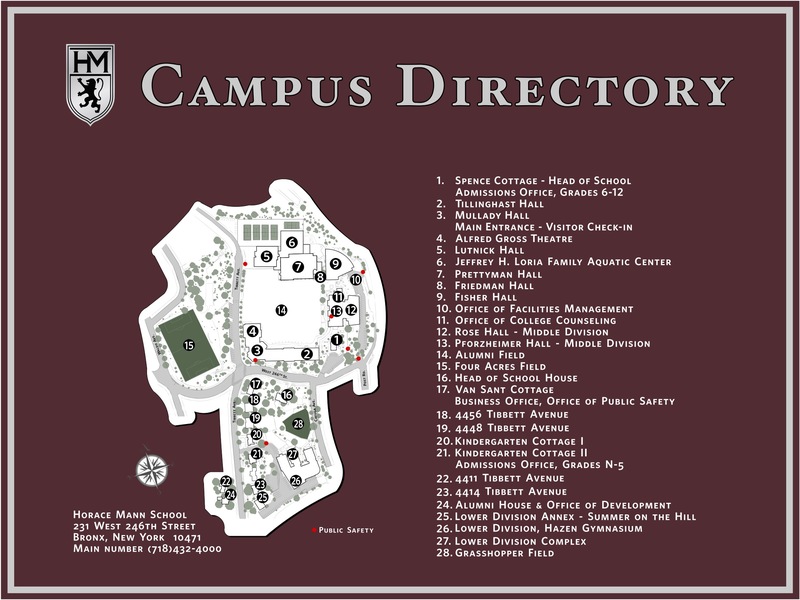 If you can't come to campus sometime soon, check out the campus map of our Lower, Middle, and Upper Division campus. We hope that you will have the opportunity to come spend some time with us and we look forward to seeing you on campus soon! To learn about our community we invite you to join us for an Open House at our Bronx campus. This event is an opportunity for you to see our facilities, learn about our program and meet Head of School Dr. Tom Kelly, Head of Nursery Division Marcia Levy, Head of Lower Division Deena Neuwirth, lower division faculty members, as well as admissions staff members. We will also be joined by our some of our Student Ambassadors who will participate in a Q&A panel and lead tours of campus. The dates of the Open Houses are posted below. Please click onto the open house of your choice in order to RSVP or call the admissions office at 718-432-4100. We look forward to meeting your family. Sunday, September 30th 2018 at 10:00 A.M.
Sunday, September 30th 2018 at 2:00 P.M. In addition to our Fall Open Houses, we invite you to join us for our Fall Family Gathering in October, hosted by our Office for Identity, Culture, and Institutional Equity. It is a wonderful way to learn more about the rich tapestry that exists here at Horace Mann School in an informal setting where our current families, students, faculty and administrators celebrate the diversity within our community. Horace Mann School’s Fall Gathering has been rescheduled as a result of weather conditions from this Saturday, October 27th, to Saturday, November 10th, 1:00 PM until 4:00 PM. If you were planning to join us for an afternoon of fun on the 27th, we hope you'll still be able to attend on November 10th. The Fall Family Gathering takes place at our Head of School's Patio and Lower Division Field. The date of the Fall Family Gathering is posted below. Families do not need to RSVP for this event. Children of all ages are encouraged to attend. There are a myriad of carnival type activities available for kids of all ages. Saturday, November 10th, 2018: 1:00 P.M. In keeping with our long standing commitment to diversity and our desire to provide a welcoming environment for all, we are pleased to invite families to our 5th Annual LGBTQ Parents Admissions Reception on Saturday, November 10th at 11:00 A.M. The reception will take place at our Head of School's residence at 258 W 246th Street. You can RSVP at the link above. Please take this opportunity to tour the school and hear from administrators and students about HM's programs and culture. We hope that your family will join us for our larger Fall Family Gathering later in the afternoon where we will have a number of fun filled activities for the entire family. Tours of the Nursery and Lower Divisions during the school day are by appointment after an application is submitted for Nursery or Kindergarten.